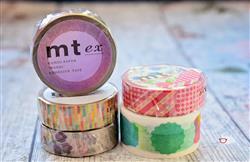 Label to your heart’s content with mt masking tape’s vibrant watercolour label washi tape. This translucent white tape features various label shapes in a watercolour rainbow of shades. Ideal for adding a bright pop of colour to your planner or journal pages, simply tear off a label by hand or cut with scissors for a neater finish. MT Masking Tape washi tape is made from Japanese ‘washi’ rice paper, which is easy to write on with a pen and reposition. Great services! Shipping is super quick and the products are just like the Ines in the photos. I'm very pleased with this store. Just had to have this in my collection ..good for travel statements.